It’s no secret that the Boy Scouts of America have a long history of discrimination. Until 2014, the organization refused to grant openly gay children membership into the Scouts, and until July of this year, gay Scout leaders were forbidden as well. But now, the organization is taking some commendable steps to atone for past wrongdoing. 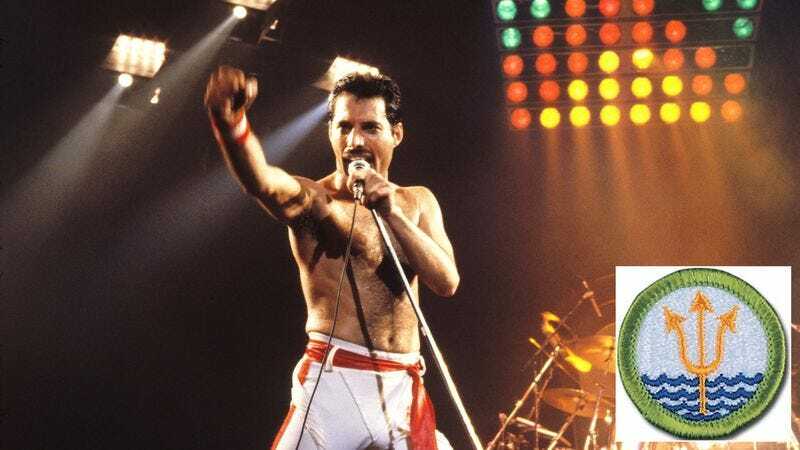 First and foremost, they’re posthumously awarding an Oceanography badge to Freddie Mercury, the gay frontman of legendary rock band Queen. Boys Scouts of America chief scout executive Michael B. Surbaugh announced the honor in a press release earlier this week, stating that while the badge cannot erase the pain caused by the organization’s longstanding policies of intolerance, the gesture can hopefully be seen as a commitment to future inclusiveness. For those who might dismiss this as an empty token gesture, it should be noted that the Oceanography badge isn’t handed out to just anyone. Typically, a scout is required to make his own functioning plankton net, describe the key biological properties of seawater, demonstrate comprehension for how tides work, and write a 500-word book report before he can even be considered for the award. So, while it may not be as big as being inducted into the Rock and Roll Hall of Fame, it’s certainly no small honor. The Boy Scouts of America still have a long way to go before they can be absolved for their history of intolerance, but this is definitely a good start!